Nice Price Or Crack Pipe: 50th Anniversary Nissan 300ZX Turbos On (30 Grand) Parade! 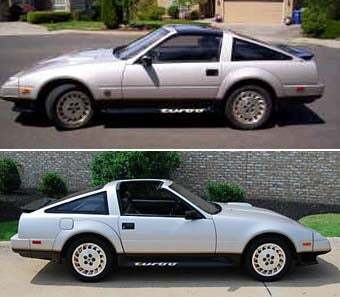 Times are good for Z-car fans looking for a low-mileage 50th Anniversary 300ZX Turbo, because two different sellers are vying for your money… nearly $30,000 of your money! It turns out that 65% of you believe that $76,000 is too much for an armored Mercedes-Benz S500, but it's really hard to find any basis for comparison for such an oddball machine. Not so with today's cars; we've got two very nice, low-mileage, T-top-equipped '84 300ZX Turbos, each priced within spittin' distance of the $30,000 mark. The first one (go here if the ad disappears) doesn't come with much description, but the odometer speaks loudly: 18,897 miles! $28,500 for that Nissan jewel. Then we've got this nearly identical car, which is being sold by the same folks who gave us the $25,000 Dodge Daytona Turbo Z. This one's got 27,129 miles on the clock and the price is $28,900, but you get way more info about the car in the description; in fact, we're a little disturbed by the very un-eBay-like correct spelling and grammar in the car's writeup- doesn't Best Of Show Automotive have any respect for eBay tradition? Thanks to Tomsk and Dolo54 for the tips! 29 grand for one of two low-mile 50th Anniversary 300ZX Turbos?